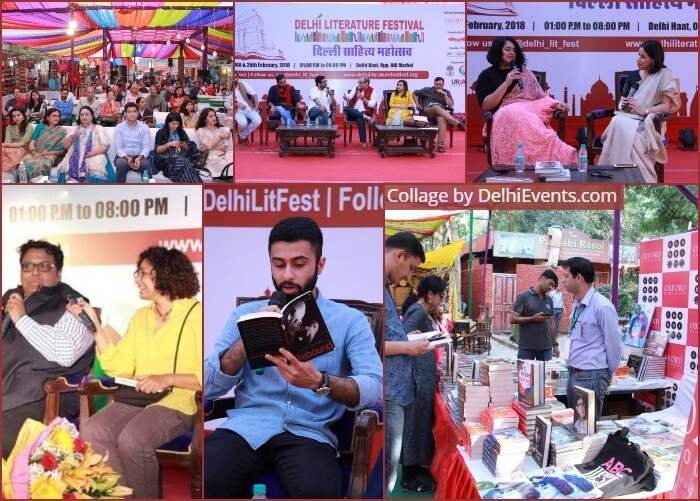 Event Description : Delhi Literature Festival is entering into the Seventh Edition in 2019. The Delhi Literature Festival (Registered) was started in the year 2013, with the objective of promoting good old habit of book reading and to promote tourism, by holding this Annual Event in the City. The first edition of the Delhi Literature Festival was Inaugurated by the Delhi Chief Minister ShielaDikshit and witnessed participation of the Delhi Chief Ministers including ArvindKejriwal, Manish Sisodia and Union Ministers in the subsequent editions of the Festival. The Delhi Literature Festival has witnessed active participation from popular Authors & Writers including Ashok Bajpai, Ashok Chakradhar, AshwinSanghi, Anna Vetticad, Blossom Kochhar, Christopher Doyle, DilipCherian, Ira Trivedi, Rama Pandey, RakhshandaJalil, Ravinder Singh, MunawwarRana, Madhu Trehan, Omair Ahmad, Om Thanvi, MaryaShakil,Rasbihari Gaur, NilotpalMrinal, DivyaPrakashDubey, Kumar Vishwas, Praveen Kumar, AshishChaudhary, Ritu Nanda, SiddharthTripathi, SanilSachar, William Dalrymple, TasleemaNasrin, SanjayaBaru, ShashiTharoor, Mani Shankar Aiyar, T K Arun, VikasSwarup amongst others. Prominent publishers includingAjay Mago – Om Books International, Swati Daftuer – Commissioning Editor HarperCollins, MileeAshwarya Editor-in-Chief Penguin Random House andSimranKhara, CEO Juggernaut have actively participated at the Delhi Literature Festival. The Delhi Literature Festival in the past has received support from the Delhi Art, Culture & Language Department Govt. of NCT of Delhi, Indian Council for Cultural Relations (ICCR), the National Book Trust (NBT), Embassies, Cultural Centres and from the leading Publishers. The organisers of the Festival have closely worked with all the leading book publishers including Aleph, Penguin Random House, HarperCollins, Hachette, Pan Mcmillan, Roli Books, Rupa, Speaking Tiger, Juggernaut and Westland amongst others. The Seventh Edition of the Delhi Literature Festival in February, 2019 plans to be bigger and more exciting with leading authors with best sellers including AseemChhabra, AmitavGhosh, Amitabh Bagchi, AnujaChauhan, DurjoyDutta, Gita Mehta, Jonathan Gil Harris, RakhshandaJalil, NamitaGokhale, Ruskin Bond, Salman Kurshid, PreetiShenoy, Twinkle Khanna, Dr.ShashiTharoor, Pavan K Varma, SandhyaMenon, Ruchir Sharma, SonalKalra, SagarikaGhosh, SiddharthGigoo, DevduttPattnaik, Ravinder Singh, Valay Singhamongst others have being lined up. Oxford Bookstore remains the “Official Bookstore Partner” to the Festival, where all the confirmed authors’, books are available on sale. Come February, Delhi will once again witness some of the most creative writers of our times, sharing their most interesting experiences and yes the Festival is open for all, so do join in celebrating Literature at the Delhi Literature Festival in February 2019.